Little by little the garden is coming together. This bit has rhododendrons, azaleas, a camelia, hellebores and various other plants. There will be more plants but the basic construction is complete. Note the mess down at the bottom of the picture. Something is digging up the soil and bark and spreading it on the gravel. We don't know what is doing it. 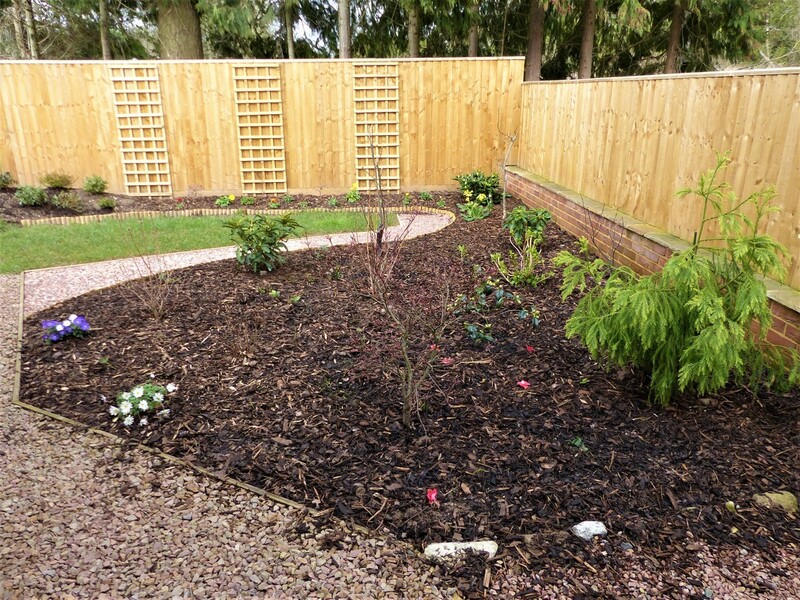 You are creating a wonderful garden around your home Sue - I shall look forward to see this when the plants are in bloom -the two of you have been very creative and busy . Could it be birds digging for worms ? eg I have seen blackbirds doing this sort of thing !! This looks so neat. I can't wait to see what going on those trellises on the back fence. Not much help about the diggers, moles maybe? @beryl Thank you Beryl. Chris deserves all the credit for creating the garden. I just enjoy choosing and buying plants 😁. Yes I agree with it could well be blackbirds but we also wondered if it could be hedgehogs as we know they’re around. @gardencat Thank you Joanne. One trellis already has a clematis, another one will have a climbing rose ( it arrived today and will be planted over the weekend) and the third one will have a trumpet vine. I think birds, probably blackbirds, must be responsible for the digging, or possibly hedgehogs. We haven’t seen any other evidence of moles in the garden or anywhere around the garden but nevertheless it is a possibility. It will be so beautiful when it is all finished and blooming! @koalagardens I would just like to see what it is 😁.